On the final day of our 3-day adventure in the wilderness area of Hawaii Volcanoes National Park, we broke down camp at Keauhou and backpacked out the Puna Coastal Trail. When I awoke I was pleased to see blue skies at sunrise — perfect conditions for landscape photography. So I eagerly made my way to the brackish ponds around the margins of the rocky cove where we camped. 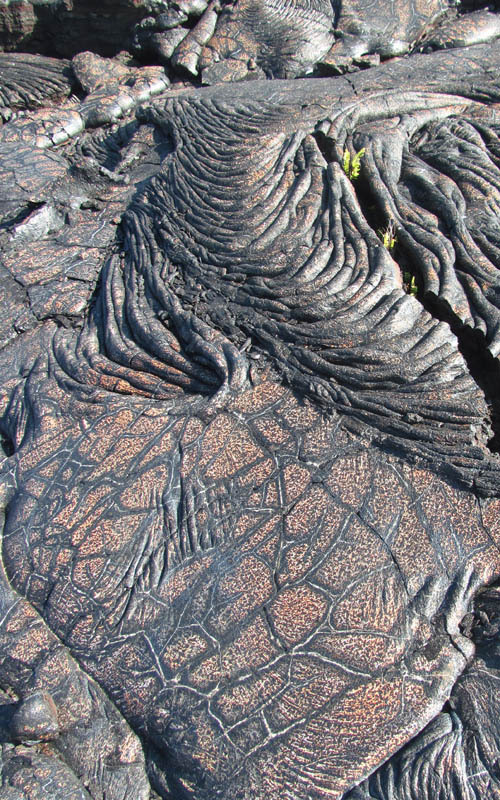 When it rains on the lava slopes of Kilauea, water sinks into the porous lava and travels underground by the force of gravity to the coastal lowlands. Since fresh water is less dense than salt water, fresh water floats on top salt water and is forced to the surface when the ground water reaches the coastline. The water in this pond is brackish — mostly fresh but with some salt water. 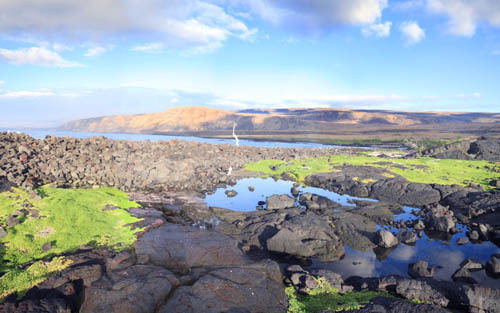 One of my favorite vantage points provided sweeping views of the coastline from Keauhou to Halape with brackish ponds in the foreground. Pickleweed thrives in brackish water and carpets the landscape in a vibrant yellow-green color. Time passed quickly as I photographed the ponds and explored the coastline. When I returned to our campsite, I ate breakfast, broke down camp, packed my backpack, and prepared to push-off on the final leg of our trek. 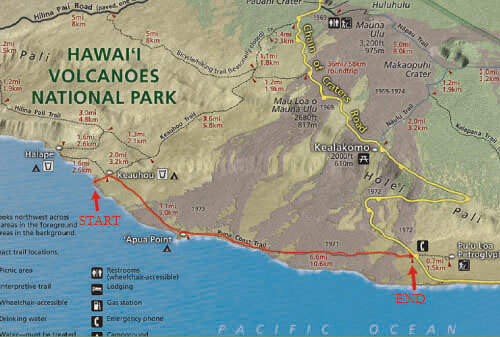 The plan was to push-off on the Puna Coastal Trail (marked in red on the map above) for 3.1 miles to `Apua Point where we would have lunch. 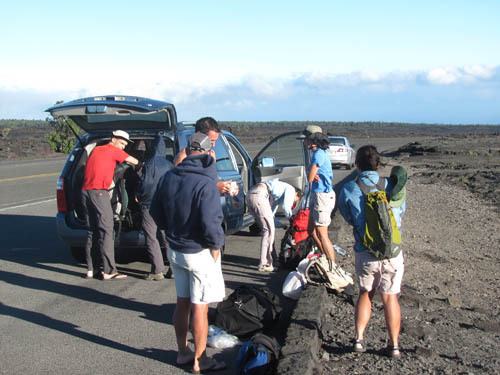 We would then continue for another 6.6 miles to reach the Chain of Craters Road at Puu Loa, for a total of 9.7 miles for the day. After stopping at the Keauhou shelter to get water, we foraged for lilikoi one last time before embarking for `Apua Point. Making our way from one ahu to the other, we hiked the dry grasslands for quite some distance before reaching the first lava field. 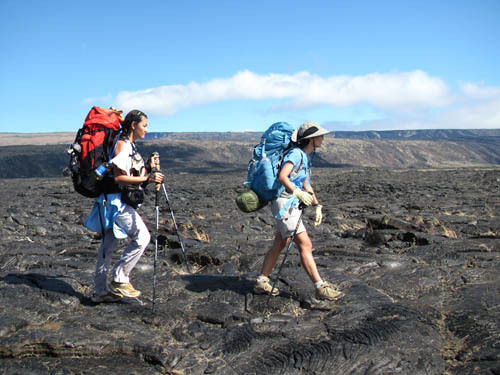 Jennie and Grace make their way over a pahoehoe flow from the 1973 erruption of Mauna Ulu. 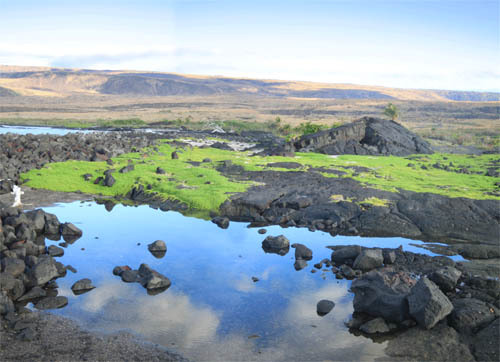 With few clouds to shade us from the sun, the lava fields heated up quickly. Fortunately a nice breeze began to blow and kept us cool the entire way. One of the eye-catching sights was a layer of lava that must have contained iron to get this rusty brown color. The crust is shattered into innumerable pieces creating a mosaic where the edges of each cracked piece is black while the interior is rusty brown. 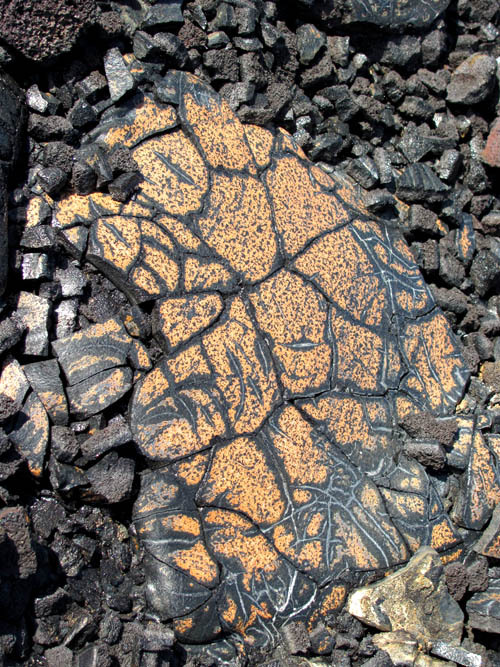 As the lava field erodes, the cracked pieces of the mosaic break-off creating a jumble of loose shards. Another interesting sight were fine strands of pele’s hair. Pele’s hair are threads of volcanic glass formed when small particles of molten material are thrown into the air and spun out by the wind into long hair-like strands. 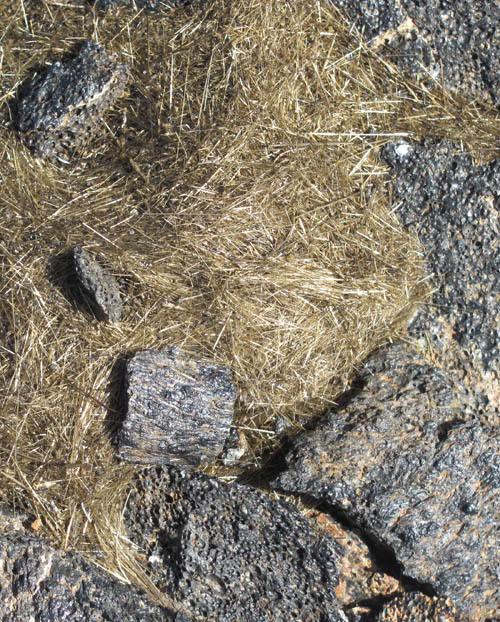 Pele’s hair is often found downwind from active vents. When we reached `Apua Point, we stopped at a camp site for lunch under the shade of young coconut trees. 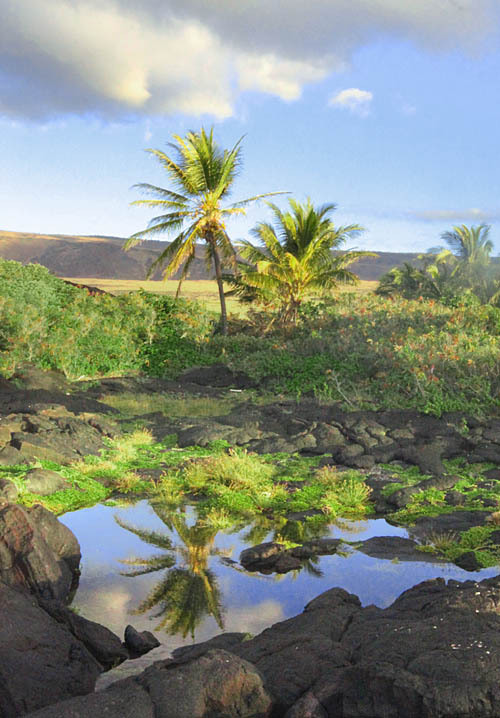 While camping is allowed at `Apua Point, there is no water catchment system. There is only an outhouse. 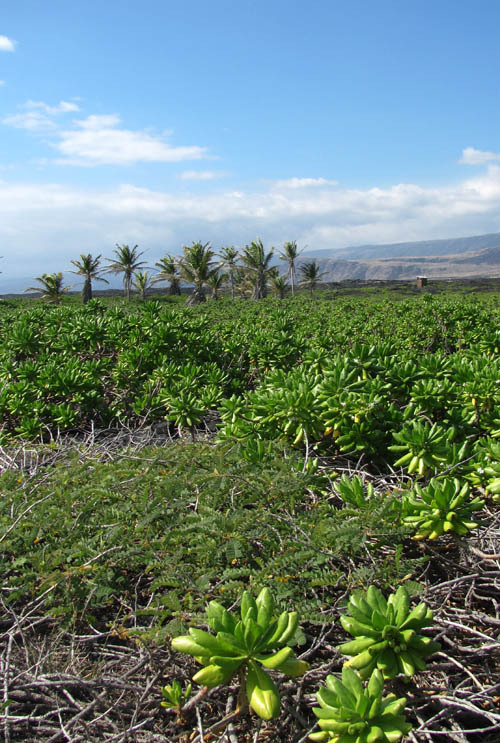 When we resumed our trek we stumbled upon several small patches of ohai (Sesbania tomentosa), an endangered endemic plant, amidst fields of naupaka (Scaevola sericea), which dominate the coastline. 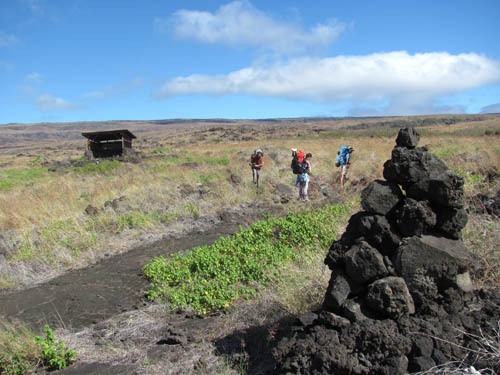 Not long after pushing off from `Apua Point, we came across the first of several cattle enclosures made from piles of lava rocks. Pat, Jennie, and Miyo head to the narrow opening of the enclosure right along the edge of the ocean. When we entered the rock enclosure we saw the remains of a great feast! 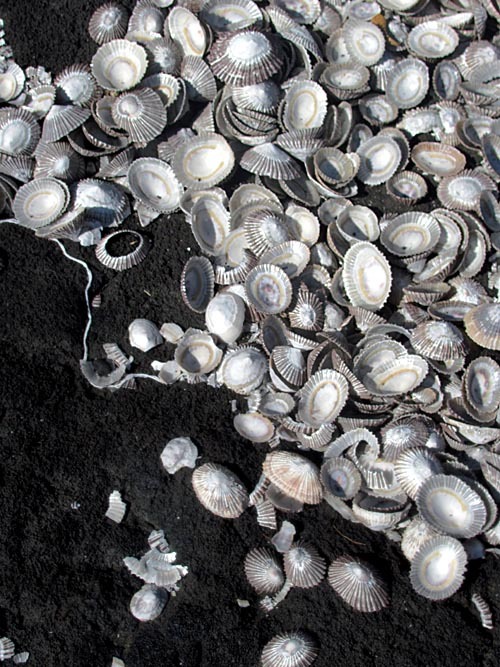 Great numbers of opihi shells littered the ground. When we encountered another small cattle enclosure further inland on the trail, we had a good view of the Holei Pali, the steep escarpment down which several lava flows have left their mark. We could also see the Chain of Craters Road make its way down to the coast. 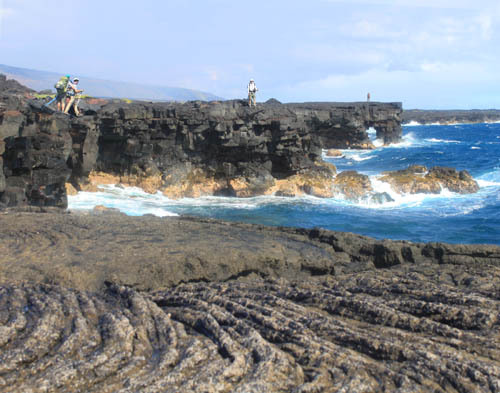 The trail briefly took us along the edge of the ocean where crashing waves have battered and carved the pahoehoe lava into a series of coves and arches all along the rocky coastline. 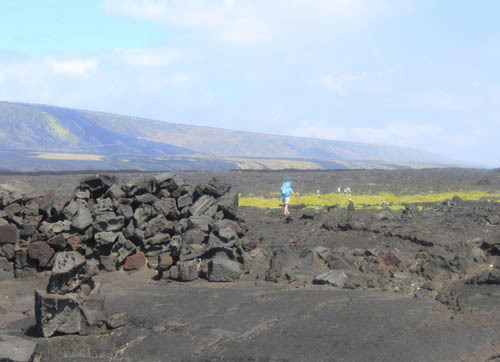 The trail goes inland for a bit passing over a large field of rusty brown mosaics and rope pahoehoe formations. Small ae ferns (Polypodium) grow in cracks in the lava where moisture collects. Pushing ever foward from one ahu to the next, we were happy to see the pole of the emergency phone in the distance. 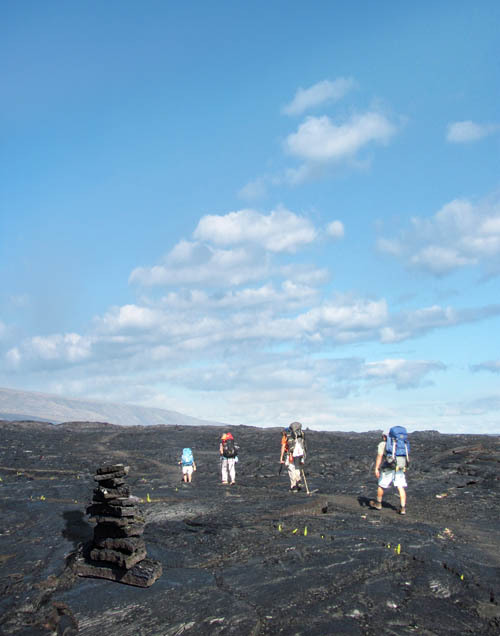 The pole marks the spot where the Puna Coastal Trail meets the Chain of Craters Road. After loading up the van, we made our way to our other vehicle at Mau Loa O Mauna Ulu and then drove to Volcano Village to have dinner before going to the airport to return to Honolulu. 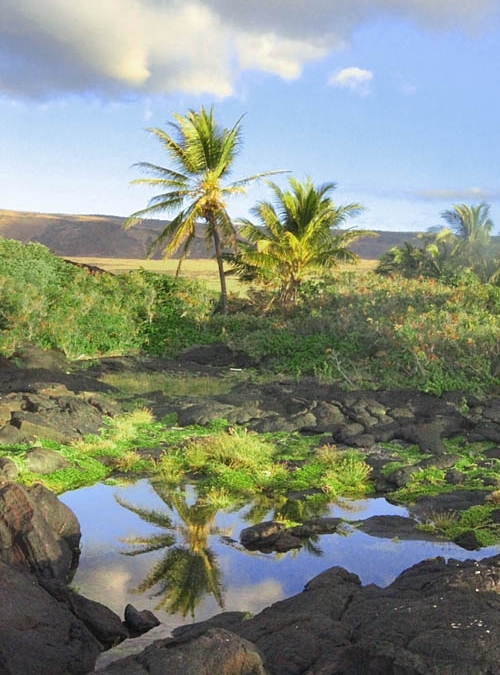 As we made our way back home, I reflected on the great time we had visiting Keauhou and Halape and the amazing sights along the Kau and Puna Coast. What a awesome trip! 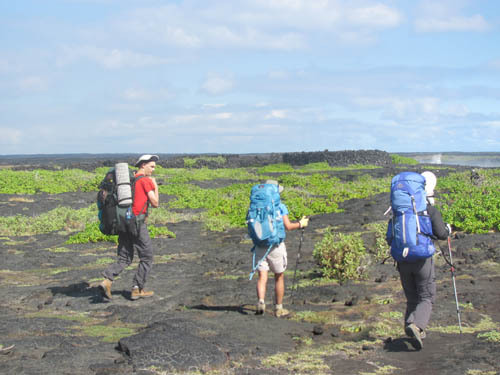 This is the last of four posts about our 3-day backpacking adventure in the wilderness area of Hawaii Volcanoes National Park. The previous post is here.